EM SLICE predicts urban microcell communications network performance, identifying possible issues before installing or buying equipment or even arriving on site. 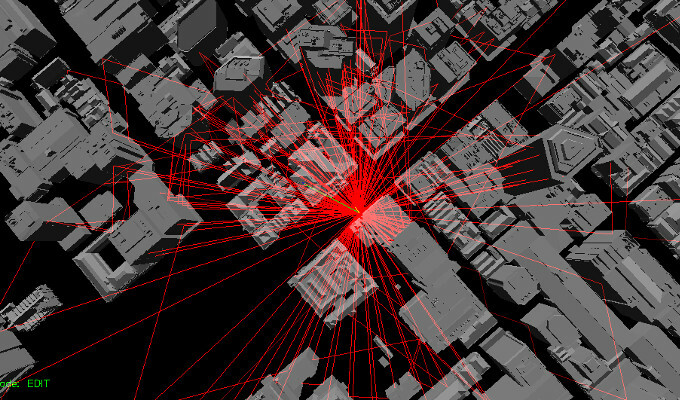 This is done by entering the urban environment into EM SLICE by importing from 3d model files or mapping data, or entering manually, then selecting the building materials used, and adding base station (AP/ BS/ TX) locations & settings. EM SLICE then simulates the wireless signal propagation through the urban environment, and predicts the expected signal strength (RSSI) that network users will receive (as well as other system performance indicators). EM SLICE considers path loss, reflection & transmission loss, diffraction, scattering and different building materials and thicknesses in its propagation calculations. Have feedback, a suggestion, a request? Make sure you also check out our INDOOR WIFI & WIRELESS NETWORKING page. 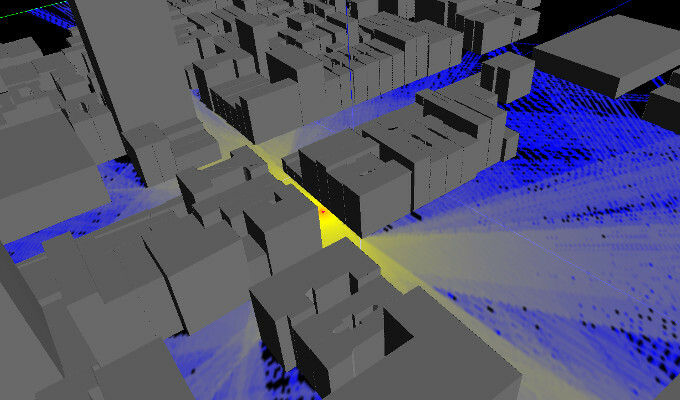 This is an example of 2d wireless network model in an openStreetmap extract from central New York. This is an example of 3d ray tracing through a 3d model of central Adelaide city (Adelaide is the Australian city where EM SLICE is developed).